By the grace and mercy of God we celebrate the completion of another year in His service. We delight in watching our children make good decisions to succeed in life. We proudly interact with our grandson, knowing he will grow up to make the world a little better place for all. We continue to enjoy teaching our Sunday School class for young married couples. In June we led a team of 30 Christians on a medical mission to Guyana, South America. On the way home we stopped on the Caribbean island of Barbados. We made several trips to Dallas this year to play with our grandson. Michael's medical practice continues to grow. He spends much time as church webmaster and elder. Michael still enjoys working with computers and genealogy. Jeannie traveled to Washington, DC, twice to lobby Congress about public education. She helped organize the State PTA Convention in Fort Smith in April. She teaches ladies' Bible classes and often does after-school tutoring at church. Jeannie sang soprano with the Fort Smith Chorale this summer and fall. She was elected to her fourth 3-year term on the Fort Smith Board of Education. Angelique is a busy wife and mother. She is studying for a Master of Arts in Christian Education while working part time at church. Greg, our favorite son-in-law, has just completed medical school and is applying for residency training. 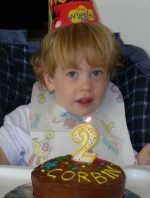 Corbin, our marvelous grandson, recently turned 2 years old and continues to amaze us with his physical and mental growth. Steven is working part time and attending the University of Arkansas in Fayetteville, studying math and Japanese for a second Bachelors Degree. Louise, our favorite daughter-in-law, earned her Masters Degree in Comparative Literature this year. She is teaching in the English department while she works on her Ph.D. Steven and Louise are members of the Northwest Arkansas Master Chorale. We hope to hear about you and your family this holiday season. May God grant you a blessed New Year.